Each year Nuremberg plays host to what probably is the world's most important organic trade fair, Biofach, and the city has been wisely using the publicity that comes with the event. If you happen to be in Nuremberg around fair time you will see several communal events around organic food and agriculture. In 2016 the city organized an organic gourmet week during which participating restaurants and eateries offered fully organic gourmet meals at fixed prices even when they otherwise do so only partially. Visitors and citizens could download communally sponsored discount vouchers for these meals. Thanks to efforts like this Nuremberg has become a city where the extra effort to find organic lunch or dinner is comparatively small. 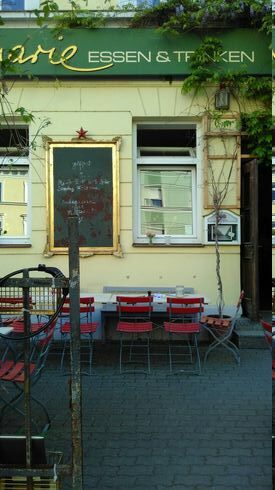 The first address in town is a cosy, almost 40 years old organic creperie, Ye'chet mad in the Südstadt neighbourhood. The audience is dominated by students, artists, theatre and cinema goers, professionals in art and culture and those interested in the resulting atmosphere. Many combine a visit with a movie in the adjacent arthouse cinema. You will be served a huge variety of fully organic whole-meal crepes, pleasantly thin, both sweet and savoury, as a main course and/or dessert. French salads, soups and appetizers round up the menu. 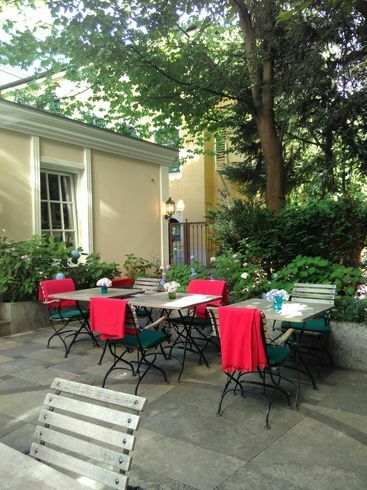 A five minutes brisk walk from tube station Friedrich-Ebert-Platz you will find an organic pub of old, the Frankenstube. As you might expect they serve rustic local dishes, but there's a long list of vegan and vegetarian versions. Indeed, the vegan cabbage roll served with a hearty tomato sauce and pasta was very tasty, and not bland at all. All organic dishes are clearly marked as such on the menu but you should be aware (especially when it comes to meat dishes) that the ones without the bio keyword are conventional fare. The beer isn't organic (nor are the cakes), but the wine is. The place seems to be a favourite among locals, crowded even on a weekday evening. A vegetarian restaurant for many years the Chesmu (formerly known as Polidori) near the fortress has long been recommended as an organic restaurant. When I was there some years ago they were no longer committed to organic food, just used a selection of organic ingredients whenever it fit in. Hence I was pleasantly surprised to hear at my recent visit that they're back on track, gradually trying to re-increase the amount of organic ingredients in their food, so it's worth asking again. The place has a pleasant informal atmosphere, a mixture of eco and modern chic, with students as a main audience. Their home-made vegan and vegetarian food with a focus on local and seasonal crops is tasty though often a little boring, typical filling meals served at places with a predominantly collegiate audience. Apart from Sundays, they do no longer offer lunch. You can choose from a large selection of organic drinks -- both coffee drinks, yogi tea, beer, wine, local spirits, and soft drinks. Disappointingly the complimentary spice cookie served with warm drinks was cheap conventional supermarket fare. Shabby chic with comic and neon elements make the environment for Klein August in Sankt Peter south of the railway tracks. Unusually for a burger grill it's not self-service but a family-friendly pub popular with women. The kitchen closes at 10 pm, and the place is closed on Mondays and Tuesdays. Some beer and soft drinks are organic as are the burger buns which are made from spelt. Make sure you order organic beef which is a little more expensive. They have a good selection of vegan and vegetarian burgers, too. 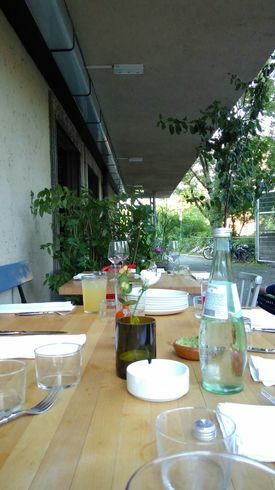 If you have an hour to wait for your train cross the street and walk inside Künstlerhaus K4 north of the central station to have a delicious organic burger, sandwich, a hearty soup or stew or simply a coffee drink at Auguste. 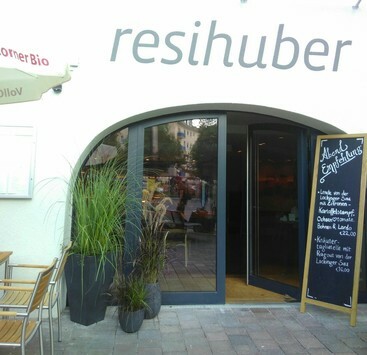 The entrance from outside is a little hard to find, enter from within Künstlerhaus (e.g. from Filmhauskino art house cinema) or from Königstorgraben. You will find a rustic pub with a nice wooden ceiling, wooden floor and upcycled wooden chairs and tables. All meals are certified organic: German soups, lever, sandwiches, burgers, fries, and more. Organic coffee in your organic coffee drink costs an additional 30c. While the milk as well as many juices and softdrinks are organic, cakes and beers (except for the organically labelled crafts beer by Klosterbrauerei Weißenohe) are not. They also serve an organic single malt dubbed Ayrer's red distilled in town, as well as a selection of organic wines (labelled bio on the menu). Expect to pay between 10 and 20 EUR for a filling burger (which on request is served without bun). Monday is veggie day when all vegan and vegetarian burgers go for 8.90 EUR. The kitchen closes at 10:30 pm, a time when you can expect to have a beer loving group of males on your neighbouring table. During my chat with the waitress I got the impression that the owners mean what they tell you in their self-description -- to be fair to customers, employees, and farmers, aiming at sustainability, and CO2 compensating. She seemed to be happy to work at the place, positively emphasizing on the team and the working conditions. In theory we all love them: The small owner-driven shops that surprise us with their unusual selection or combination of goods and food made with love and care, vibrant places with a special and welcoming atmosphere or homely places of peace where we can sit and wonder and get inspired. Shops who's owners create a place from their ideas of a human world, who are ready for a chat if desired but not pushy in their sales attitude. Places that are somehow home away from home, places for a rest or for inspiration. Places where we hopefully buy stuff since we're not forcibly persuaded by aggressive marketing. And yes. There are these places, and it doesn't come as a surprise that many of these shops offer organic items. Imagine the dry fruit and sweets display of an oriental bazaar stall, and put it in the middle of a crammed book shop filled with mediavistic and orientalistic literature. Sit down in front of the shop or at the bar table inside and order oriental-style coffee, tea, mezze, and -- most recently -- also organic Japanese fried chicken (karaage) or matcha cake, prepared by a Japanese chef. Have a chat with the owner and scroll the book shelves while you wait -- you will find interesting media on medieval arts and crafts, food, biographies of historic persons, films, facts and fiction in German, English, and even French. Your meal -- the falafel, soups as well as occasional Japanese food -- will be fully organic as are the drinks and many of the dried fruit. Not everything else, but where in Munich will you find sweets imported from Damaskus? You will also find earthen oil lamps, soaps from the now sadly destroyed soap shops in Aleppo, home-made rose jams, aged Turkish Arak and more. Saladins Souk, also dubbed Haidhauser Oase as the blackboards in front of it have it can be found in the beautiful quarter of Haidhausen a few minutes North-West from Ostbahnhof station. Be prepared to find an always changing display of (not always organic) delicatessen often brought by the owners from their travels or made by their friends. (As of today the shelves are filled with French delicatessen, unfortunately most of them conventional produce.) The deep-fried lunch items are prepared more healthily in a low-fat fryer, and birch sugar is used as sweetener throughout the menu. You can also order lunch delivery as long as you phone in between 10 and 12 am. Love to sit down with a good book and a glass of good wine? No question, the two are a perfect match, and even if you're more into an organic softdrink (Bionade), the Buchhandlung Lentner bookstore near Rosenheimer Platz with its cosy cafe is a place where you can stay for hours sitting, watching, chatting with the staff and reading. If you're not able to read German shop of their carefully selected wines, some of them organic. They will also order English books for you (send e-mail, phone in or use their webshop in advance), but this may sometimes take longer than the usual overnight order service for German books. Unfortunately, neither the coffee nor the milk are organic, but if you ask they'll perhaps offer it next time. In the vicinity of the Gärtnerplatz party hotspot step by Cafe Phasenreich, a lovingly curated organic fashion and design temple. You'll find t-shirts, trousers, shirts, jackets, underwear and accessoires for both, men, women, and toddlers, as well as sustainably produced bags, watches, radios, design objects, postcards and even confetti. Enjoy an organic coffee drink, smoothie, sandwich or cake before you take a second look to find the unexpected item that you always wanted to own. They moved recently, so don't be surprised if you find them listed elsewhere under their old address in Baaderstraße 33.